With the hot weather finally breaking and some decent rain, things have started to take off again. About 5 days before the rain started, our 2500L rain water tank ran dry. Within 3 days of rain, it was full again. The centre vegie patch is now looking like it has some life in it. The tomatoes are growing fast and the largest is producing fruit. The capsicums are starting to flower. The strawberries have been putting out runners like crazy and I've been nailing a few down so they'll put down roots. 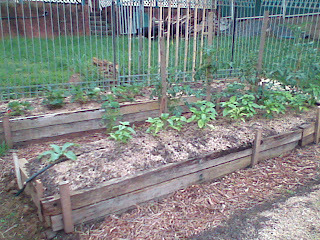 This weekend I decided (somewhat belatedly) to stake the tangled mess of tomatoes in the front garden. I'd been letting them ramble, but with the wet weather they were starting to get manky. 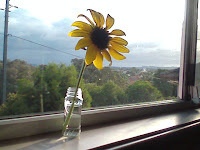 The sunflowers have been producing a glorious display. 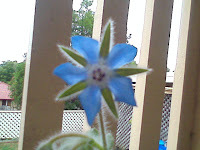 Each plant has one big central flower, about 30cm in diameter, but also a bunch of smaller side flowers. They've been brightening up my house on the cloudy days. Time to plant more seeds and this weekend I put in a row of leek seeds and a row of celery seeds into the seed raising trays. In a couple of weeks I'll put in another row, and then another lot a few weeks later. This should hopefully been I don't get inundated with celery and leeks later. I also planted a entire tray of marigolds and an entire tray of pyrethrum. The first planting of marigolds are still going well, but the first batch of pyrethrum didn't survive the heat. Speaking of marigolds, I've been collecting the seed from the dead flower heads. Anyone want any marigold seeds? In the side vegie patch, it looks like we've lost the corn crop to lots of tiny green bugs that have gotten in between the sheaves surrounding the cob. I have no idea what they are. Looks like they got into all the cobs and the kernels looked shrivelled and dry. Ah well, you loose some crops. On the plus side, the broccoli is finally starting to produce heads. Most of the plants are riddled with holes from cabbage white butterfly grubs (rotten little buggers) and I haven't managed to get down there with some Dipel to deal with them. I'm hoping that the damage is mostly to the leaves and they'll still produce decent heads. Reading my new gardening book, apparently I should have sown brassica seeds early this month and be planting out seedlings next month. I'm still getting the hang of this "what to plant when" part. Can't wait to plant these!